O’Reilly’s Revisited: The Wings Are Wonderful. I’ve written about O’Reilly’s before. My feelings about the pepper burger are well-known. And other than a pepper burger a side of sweet potato fries and an interest in their daily specials I have never tried, I had little more to write about this favored dive bar. That is until I tried their wings. I am not sure how the wings escaped by roving eye. Well, actually, I know how they escaped. I don’t have much ardor for wings. I find them frequently disappointing. In our city, I can not think of many wings worth the effort. Roosters are pretty good. Barley’s Smokehouse brines, smokes and grills their wings, it is a lot of extra work but the end result is very good. 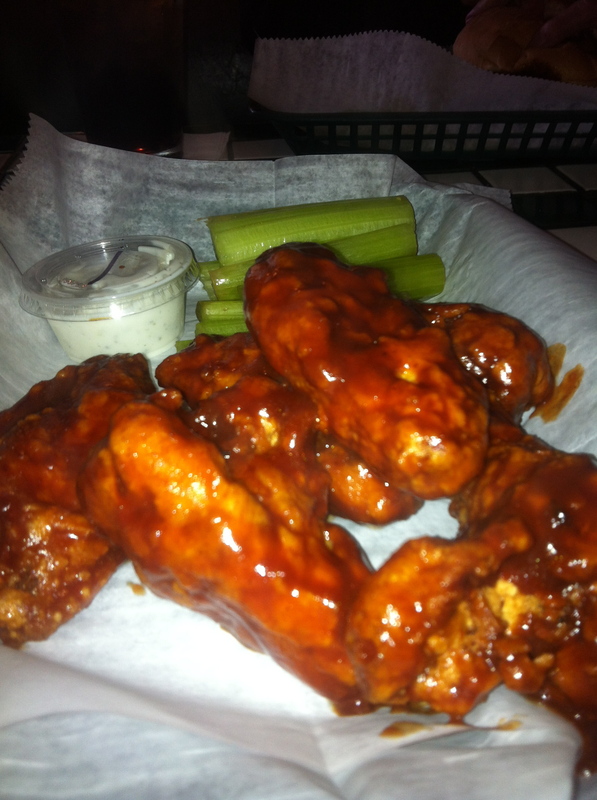 I did have wings at the original Anchor Bar, I liked those, as much for the tradition as the taste. I can’t think of any other wings that have made an impression. If you know of a place that does serve really good wings, let me know. So a few words about the wings at O’Reilly’s. They are sold by the pound. They are large and meaty. They are deep-fried to a fine crispness. And they are densely breaded. The breading holds the sauce to the wings, so that it clings to the entirety of the surface. I tried the “Scott’s style” which is extra hot, but not painfully so. They are typically served with extra sides of chunky blue cheese sauce. Not too hot but really close to being too hot to handle. My intuition and taste buds suspect that the wings may have been liberally dosed with Franks Red Hot Sauce or something from that family. Other than the 25 cent wing special of decades ago at the fabulous Mill Tavern (Wilson Mills Road) in Cleveland, I can’t think of another wing I wanted to go back and have the next day. I want 2 lbs. of O’Reilly’s wings right now but probably one lb. of wild and one lb. of mild – which are far from that – the mild are served traditional buffalo style with a dab of heat. This entry was posted on November 10, 2013 at 2:44 PM	and is filed under Clintonville. Tagged: O'Reilly's. You can follow any responses to this entry through the RSS 2.0 feed. You can leave a response, or trackback from your own site. Jim – Next time you are on the west side, stop into the Roadhouse. I think this operation does as good a job on wings as any in Columbus.